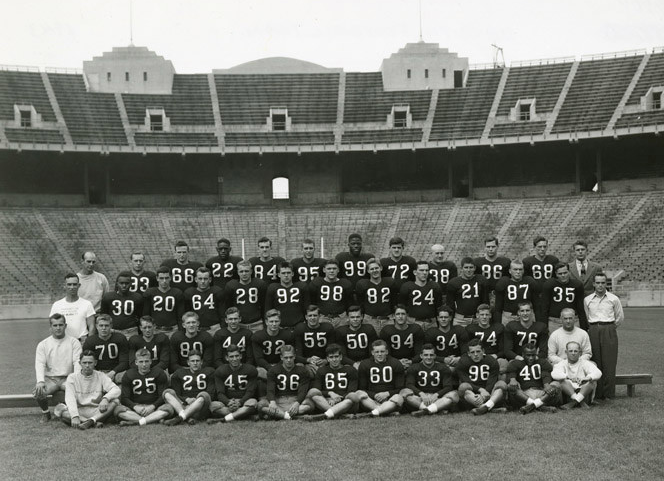 #26 Bill McCarty (1st row, 3rd from left) on Paul Brown's infamous 1943 "Baby Bucks" team. 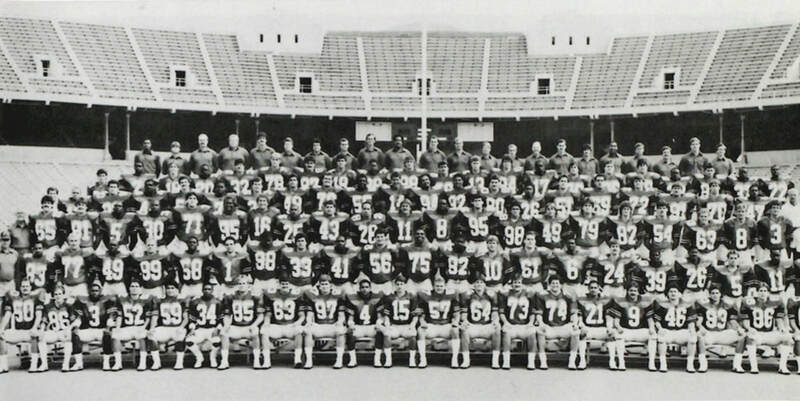 Ravaged by WWII and military rules not allowing ROTC members to participate in football, the legendary Bill Willis (#99) was the only returning starter on the entire roster. 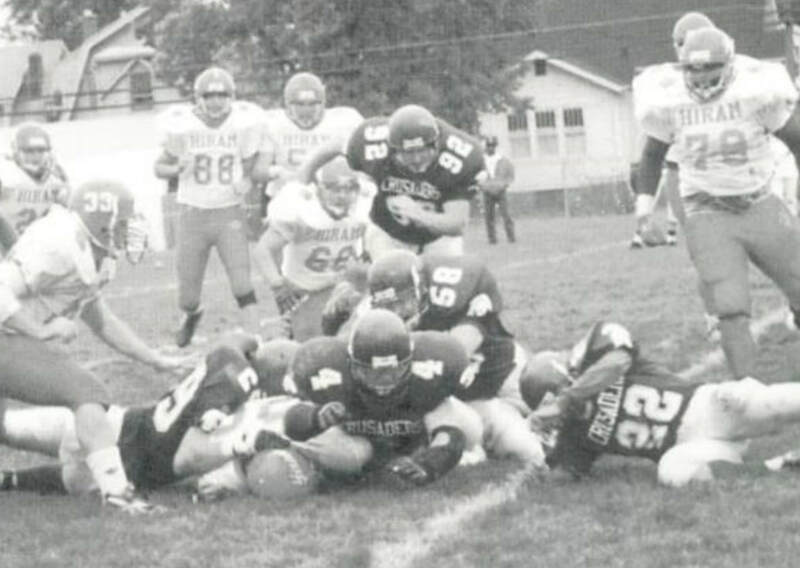 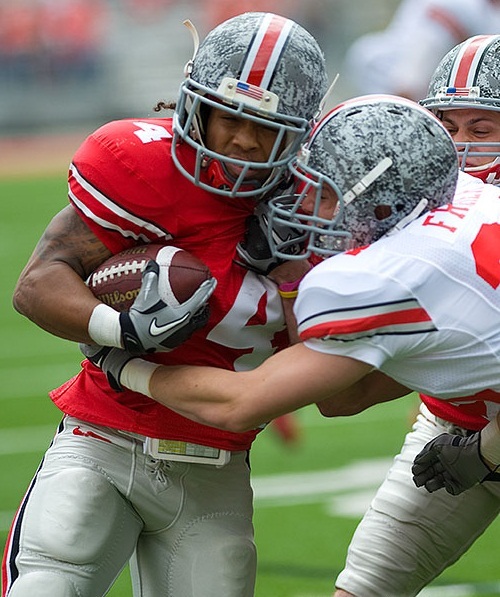 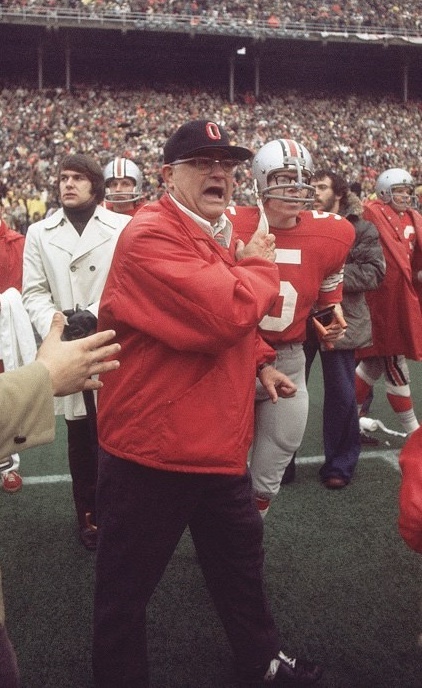 Tim Woodruff (bottom left) scrambles to scoop up a fumble against Bo Schembechler's Miami University football team. 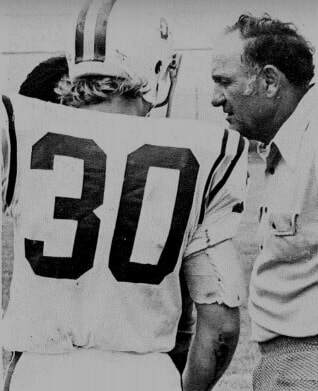 Scott Reall (#30) awaits instruction from Otterbein coach Moe Agler. 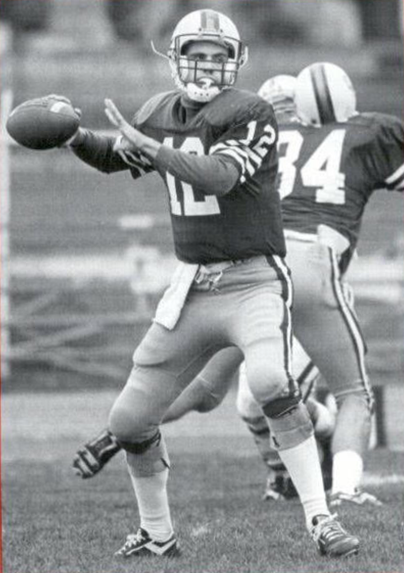 Reall was an All-OAC defensive back in 1973. 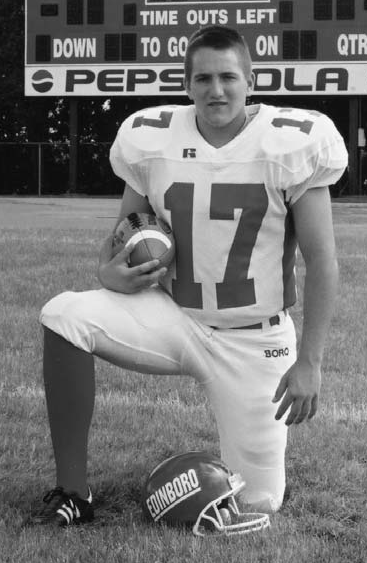 Eriech Horvath lettered 4x at Capital. 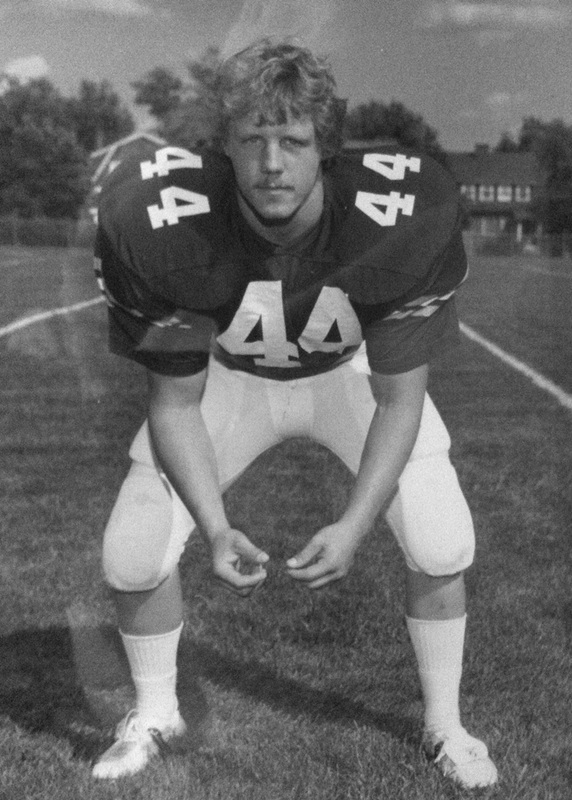 He was First Team All-OAC and Team MVP in 1983. 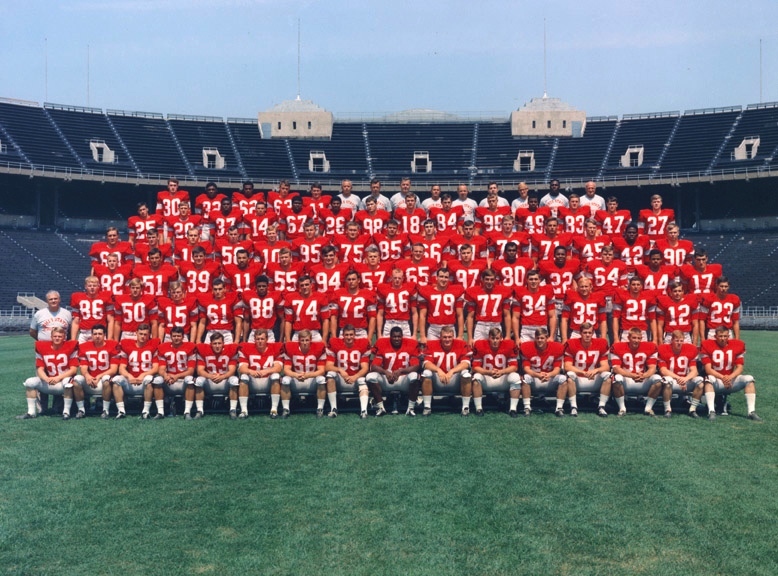 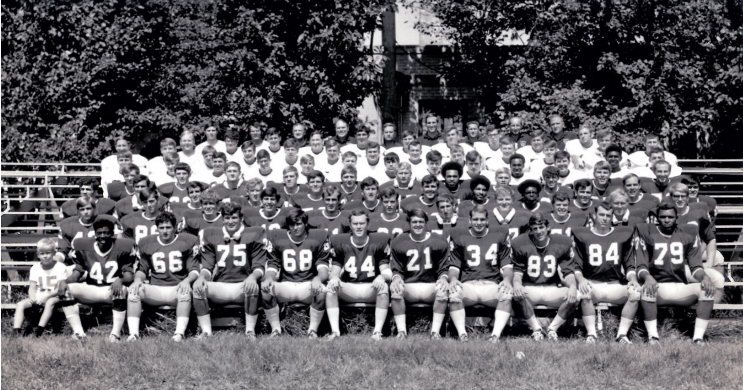 Jeff Doty (#3, end of third row) started and lettered at quarterback for the University of Louisville in 1983, before transferring to Ohio State where he played with the likes of Mike Tomczak, Jim Karsatos and Tom Tupa. 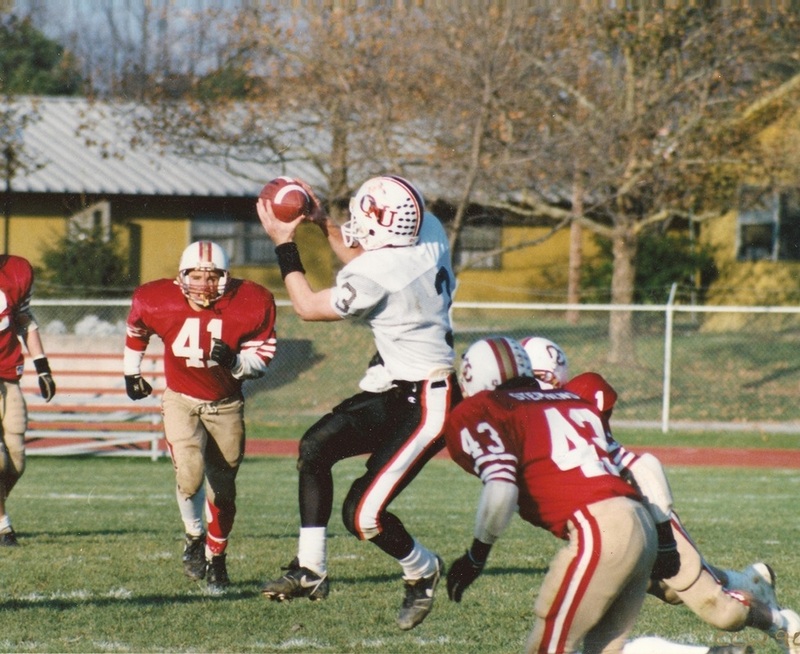 Luke Hanks was a 4-year starter and letterwinner at Quarterback for Otterbein, where he still holds the school record for most passes thrown and completed in a season and career. 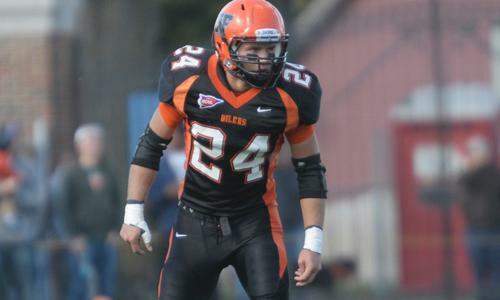 He was also a 2x All-OAC performer. 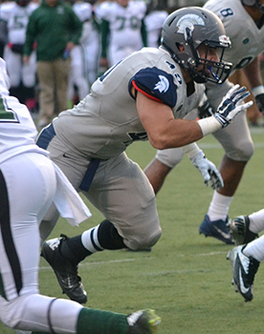 Ryan Aleshire (#4) gang tackles a Hiram opponent. 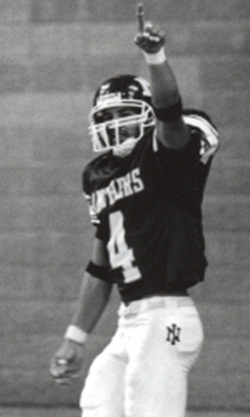 Aleshire was a 3x letterwinner for Capital (1994-1996). 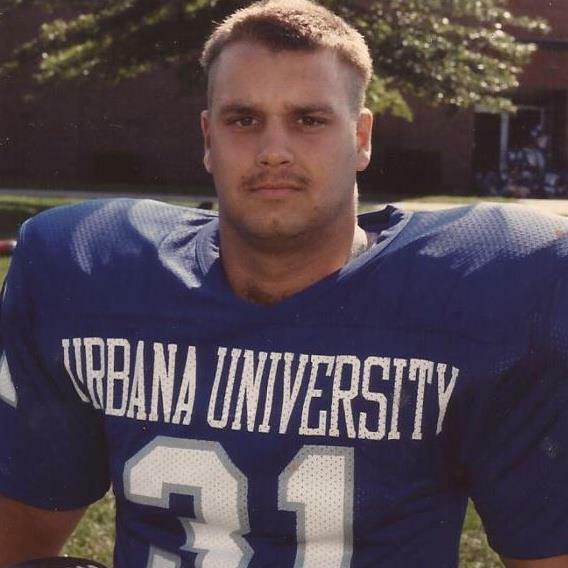 Erich Hopkins was a 4-year starter at Urbana University. 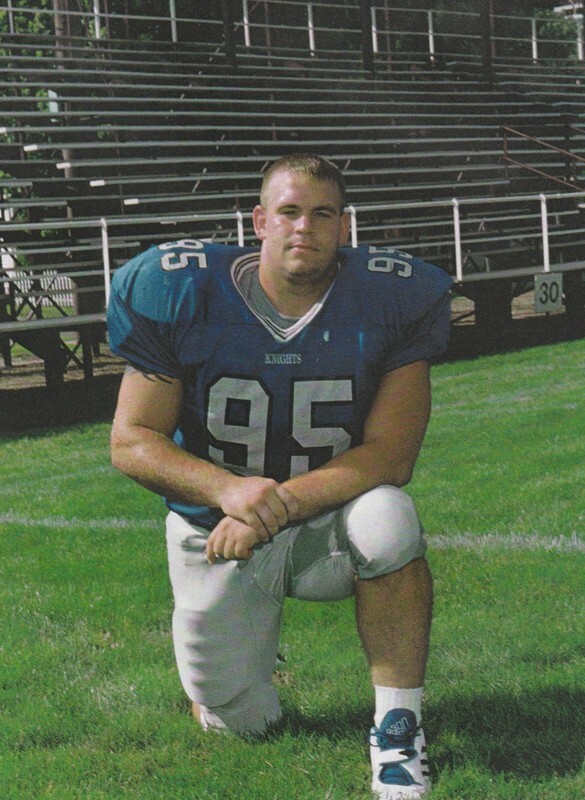 He was a 2-time team captain, 2-time All-MSFA selection, and was also selected as a member of the Urbana University All-Quarter Century Team in 2014. 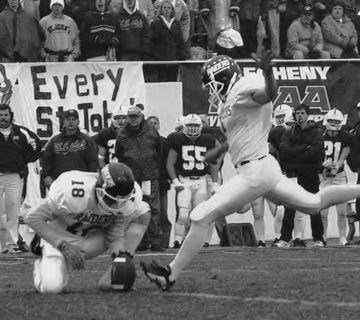 Rodney Chenos kicked this 20-yard game winning field goal with one second left during the 2000 Stagg Bowl, crowning Mount Union as National Champions. 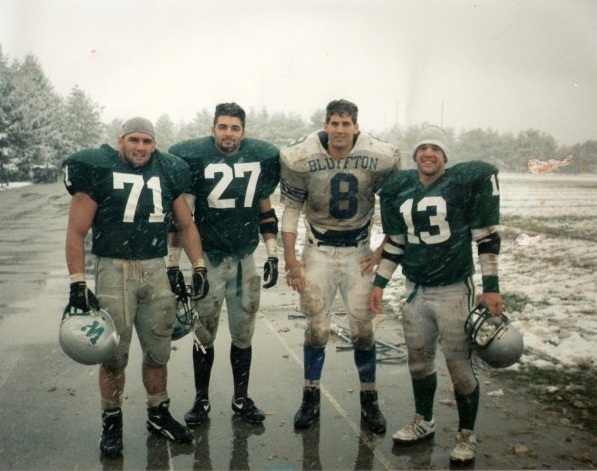 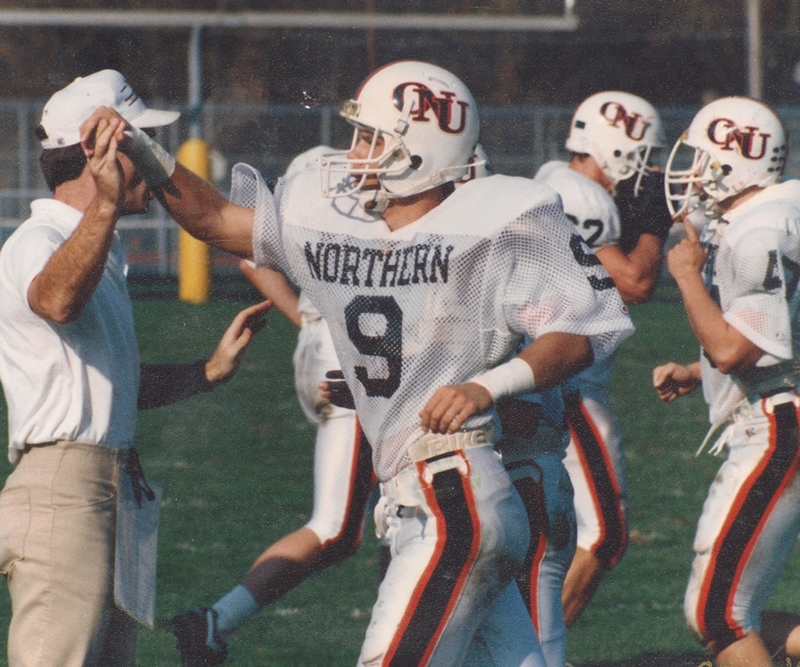 Chenos was a 4-year starter, and a 3x National Champion while at Mount Union. 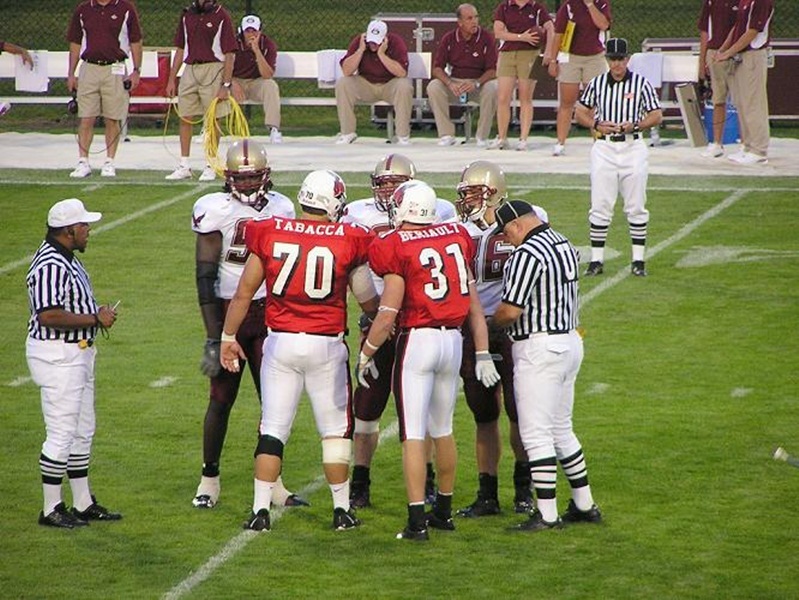 Nick Tabacca was a team Captain, 4-year letterman and was twice named to the All-MAC Academic team for the Ball State football team. 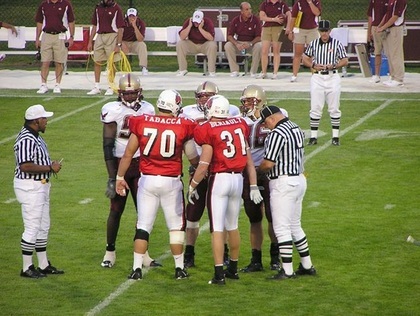 The Hausler twins (Capital) earned a combined 8 letters, 3 1st Team All-OAC awards, 3 D3 All-American honors and the Lee Tressel Award, given to the top defensive back in the Ohio Athletic Conference. Thom is the all-time Capital leader in career Punt Return yardage with 1,026 yards, and Kyle is the all-time leader in career interceptions with 23. 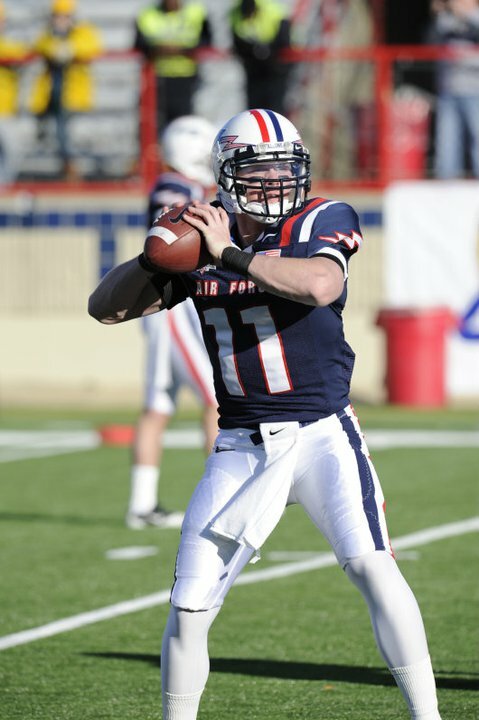 Connor Dietz earned 4 letters as a quarterback at the Air Force Academy, and was the starting quarterback in 2012. 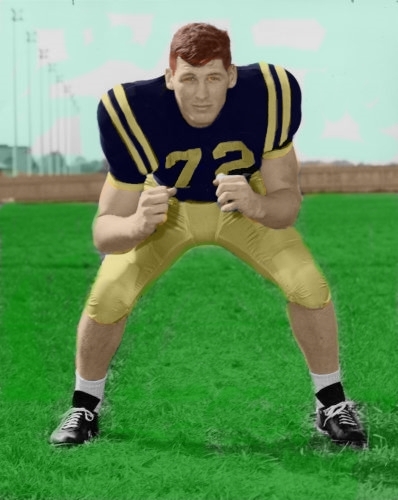 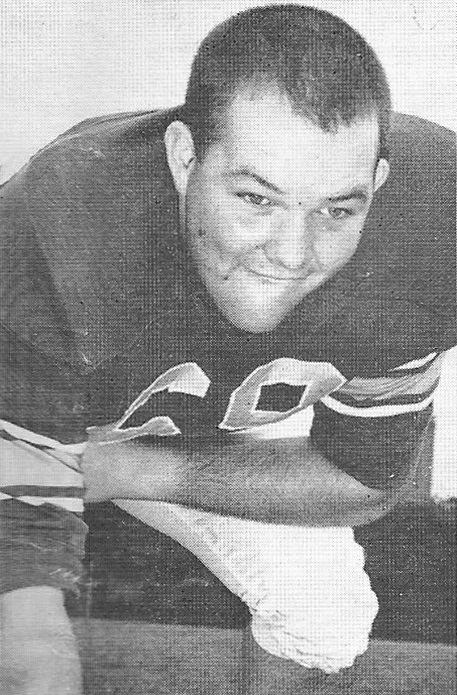 Pat Dougherty was a 4x letterwinner at defensive end for Georgetown College. During his career Dougherty recorded 112 total tackles, including 13 sacks, 24 tackles for loss, 3 forced fumbles, 3 fumble recoveries, and 6 break-ups. 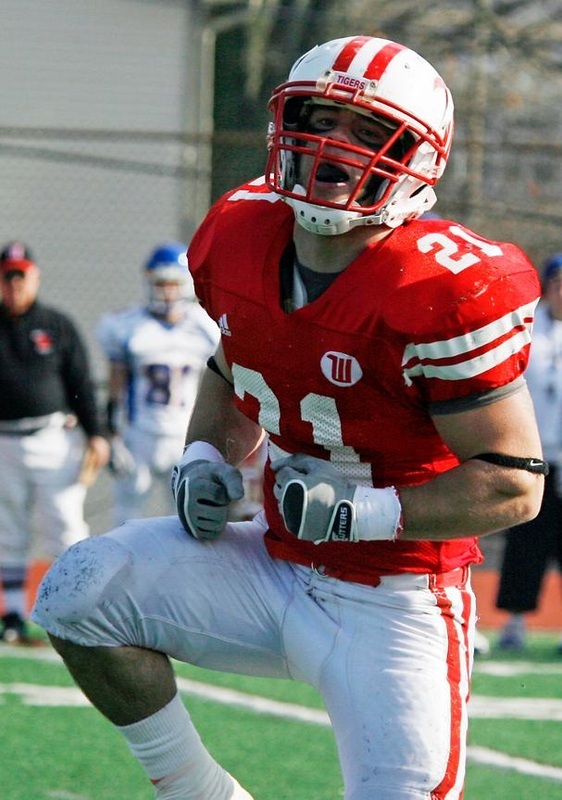 He was named All-Conference in 2012-2013 for his play on the field. 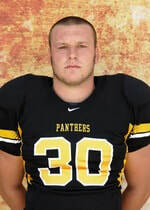 In the classroom he was a 3x All-Conference Academic performer, a 2x Daktronics-NAIA Scholar-Athlete (2012-2013), and a CoSIDA Capital One Academic All-District honoreee in 2012. 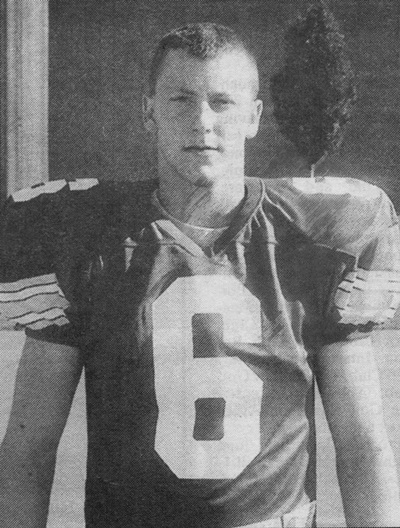 Kenny Klatt was a 4x letterwinner at the University of Findlay. 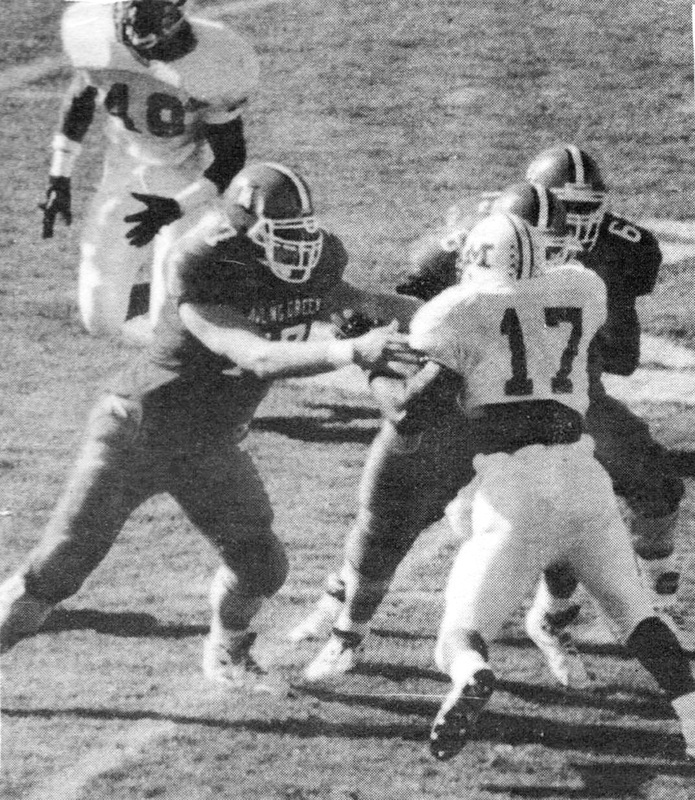 During his career Klatt tallied 267 total tackles, 16 tackles for loss, 5 forced fumbles, an interception and 6 pass break ups. 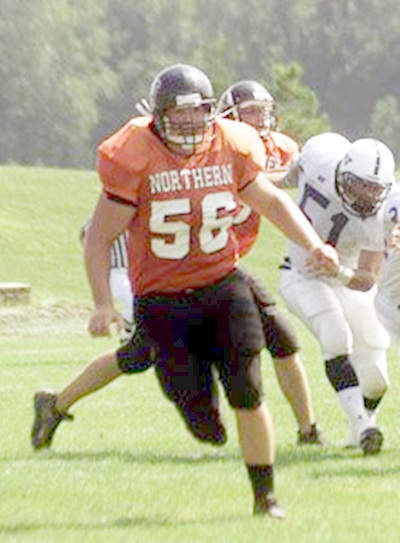 He was named All-GLIAC in 2010 and 2013. 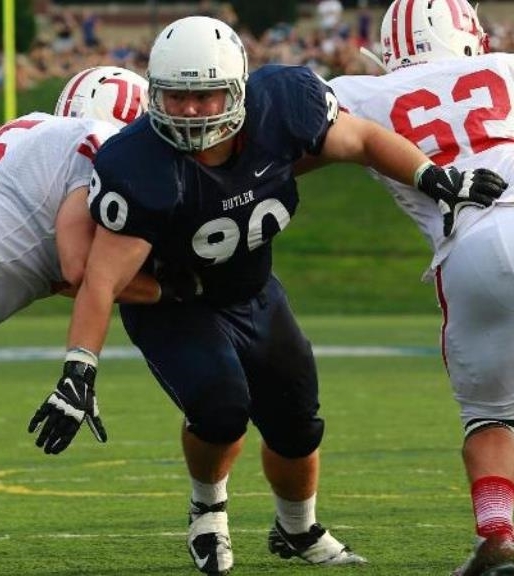 Kyle Annis earned 3 letters for Butler while being named to the All-Pioneer Football Conference team twice, All-PFL Honor Roll 3x, as well as the 2012 PFL Defensive Freshman of the Year. 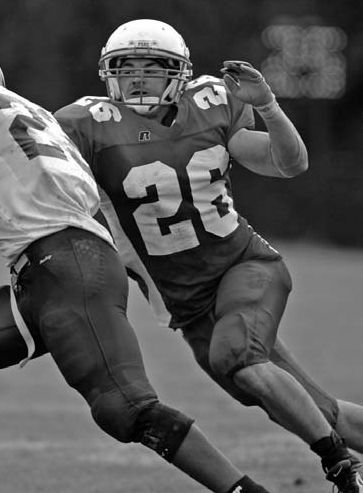 In 2015 he was named to the 2015 National Football Foundation Hampshire Society (College football players who have maintained a 3.2 GPA or better throughout their college career). 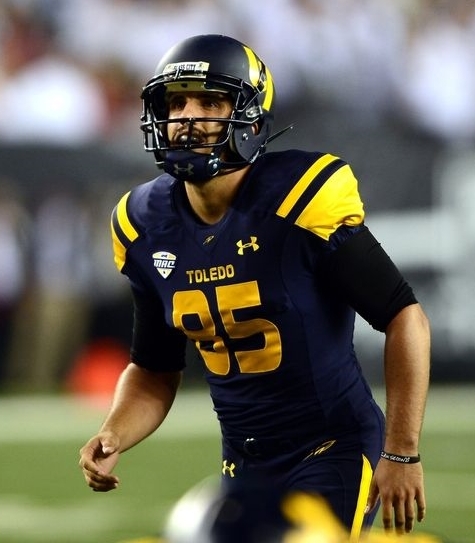 Jeremiah Detmer (Toledo) was the 2013 MAC Special Teams Player of the Year while being named to the All-MAC team 3 times. 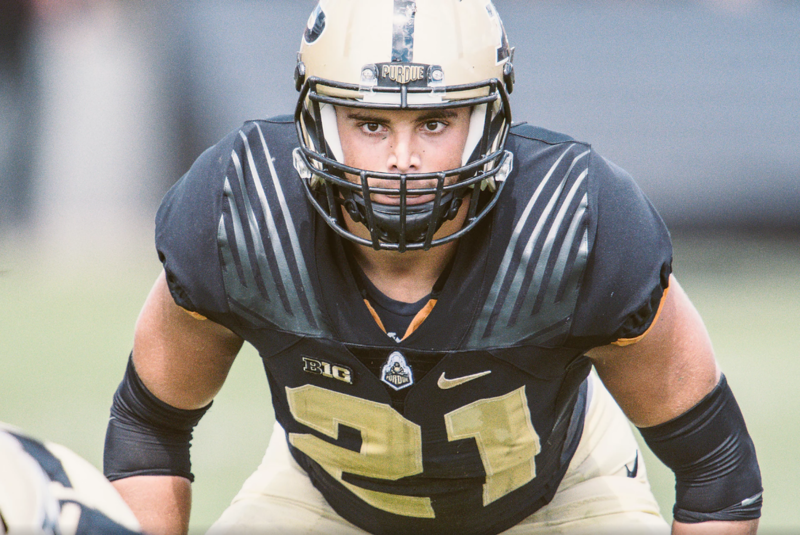 He was also a semifinalist for the Lou Groza Award in 2013, and a preseason Groza Award watch list kicker in 2014. 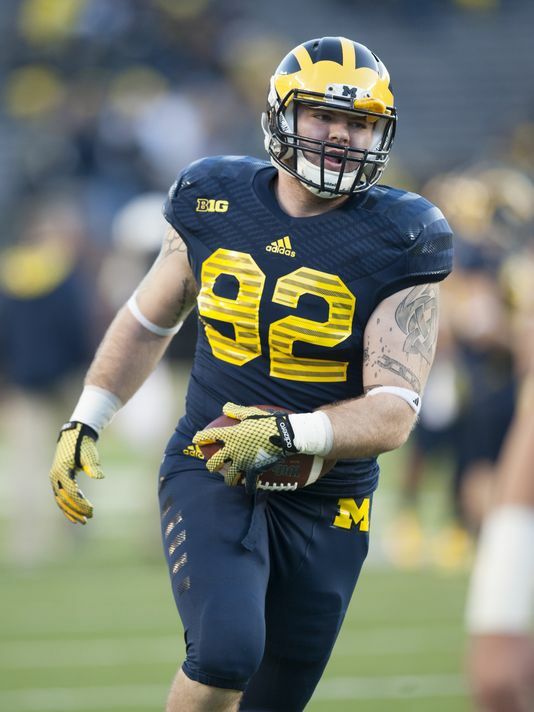 Detmer played in the 2015 NFLPA All-American Bowl to cap off his college career. After college he spent the 2015 preseason with the Chicago Bears as an undrafted free agent. 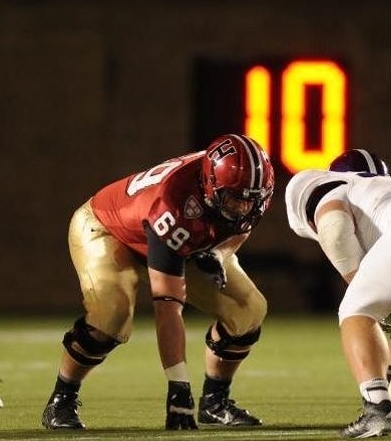 Jordan Weatherby earned two letters for the Harvard Crimson football team in 2014 and 2015, where he was contributor on the offensive line. 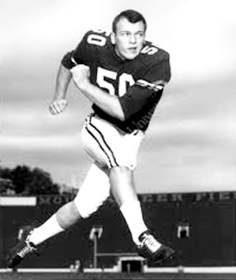 Keith Heitzman lettered 4x at the Univeristy of Michigan and Ohio University, respectively, starting over 20 starts in his career. 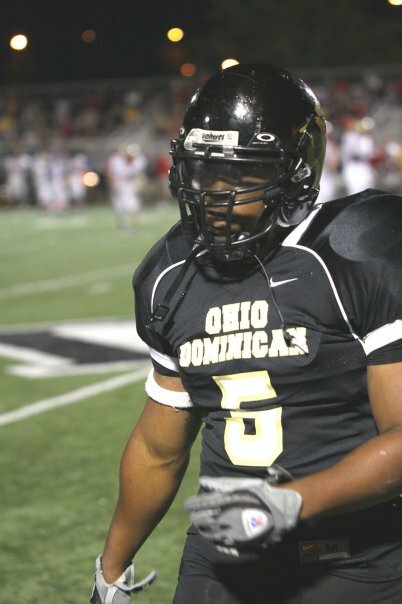 His Graduate Senior year at Ohio is statistically considered his best as he caught 22 passes for 297 yards and 3 touchdowns. 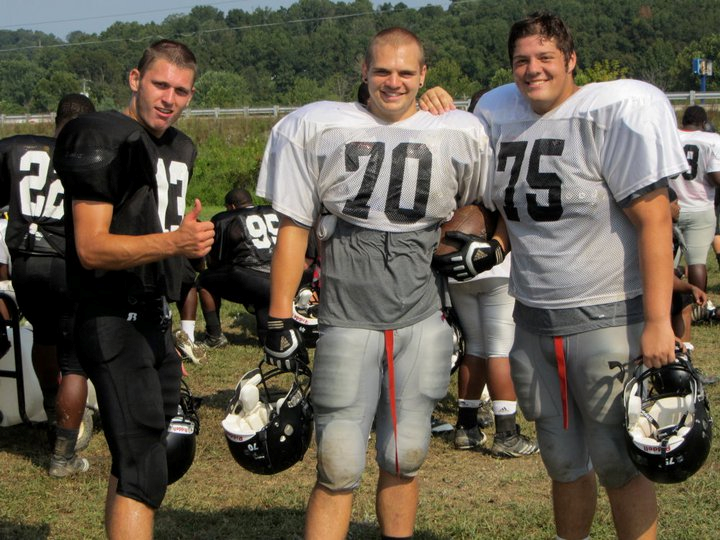 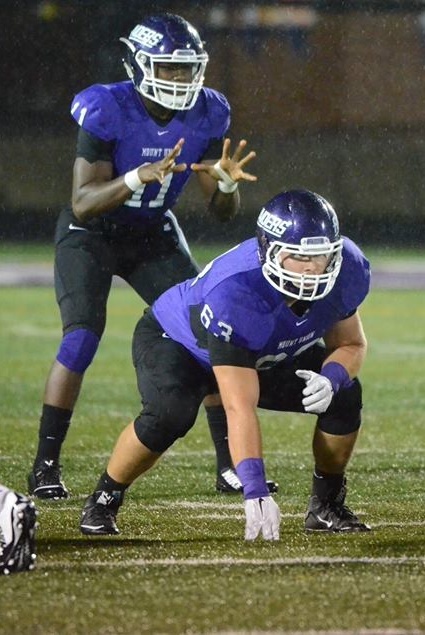 Tyler Baker (bottom) was a 3x letterwinner on the offensive line for Mount Union, and a starter for the 2015 National Championship team. 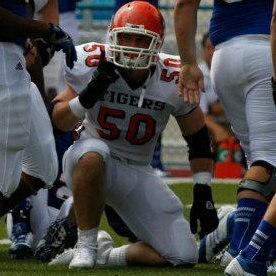 Baker won two NC titles while at Mount (2012 & 2015). 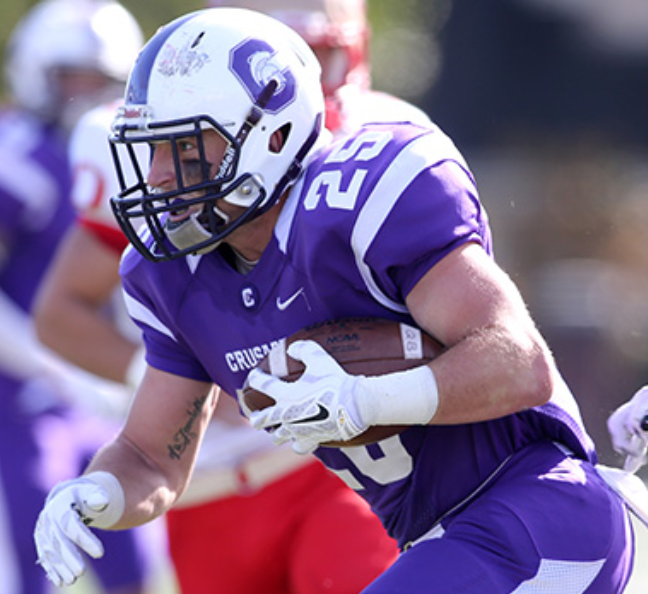 Nick Waters was a 4x letterwinner for Capital University, where he has started 28 career games at receiver and halfback. 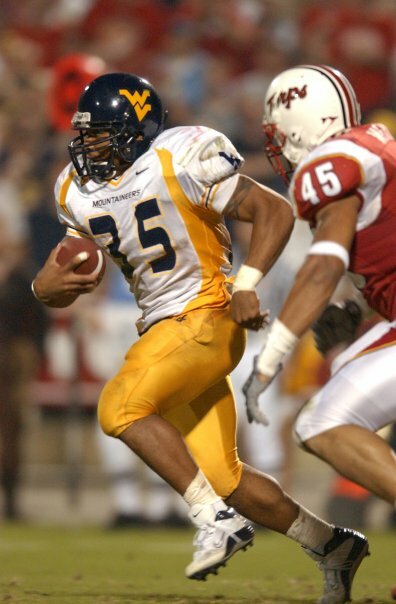 Through his career Waters accounted for 3,272 all-purpose yards, including 695 rushing, 844 receiving, and 1,733 on returns. Following the 2017 season Waters cemented himself as the all-time school leader in kickoff return yards, with 1,707 yards. 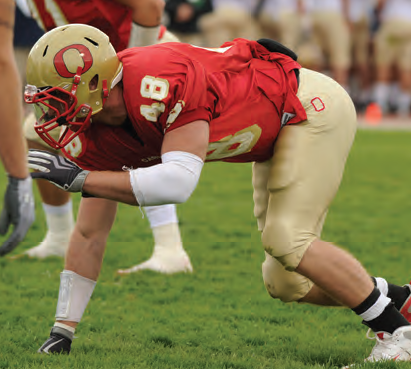 He was an All-OAC performer in 2015. 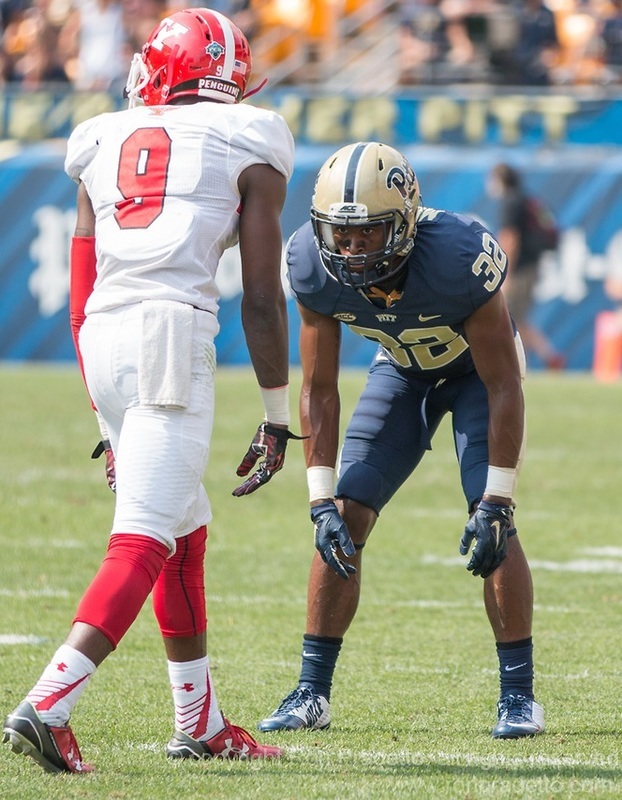 Phillipie Motley is a 3rd year letterwinner at Pittsburgh, where he has been a regular on special teams, and started 4 out of 27 career games.